The cardamom plant is a perennial herbaceous plant (Elettaria cardamomum), native of Ceylon and India and belonging to the same family with ginger. The plant produces large creeping rhizomes or rootstocks and leafy stems 6 to 10 feet high in dense clumps. The leaves, somewhat resembling those of the ginger, are 1 to 3 feet long and are provided with conspicuous pinnate veins. The flowering stems are about 2 to 3 feet high and bear numerous flowers in short racemes. The fruit of the cardamom is rounded and usually somewhat 3-angled. It is 3-celled, each cell containing about 5 seeds. The fruit is picked in a green condition, dried, and bleached in the sun and usually further bleached by sulphuring. The capsules are then cream white and papery in texture, being about 1/2 to 3/4 inch long. Cardamoms are propagated by division of the rootstocks, which are planted about 8 feet apart both ways. During the early stages of growth some shade is desirable. 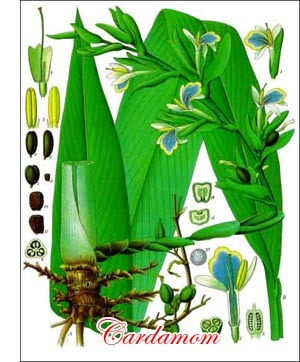 The cardamom plant begins to bear at the age of 3 years and comes into full bearing at 6 years. From this time on for many years a yield of 100 to 300 pounds of dried cardamoms may be expected per acre. The plant bears the year round but the best crop is obtained during the dry season. It is desirable to harvest the fruits by cutting them off with scissors. A good days picking for one laborer is 10 to 15 pounds. The worlds supply of cardamoms comes almost entirely from India, especially the Malabar coast and Ceylon. Ceylon exports about 500,000 pounds annually. Cardamoms are used as a spice for curry powders, flavoring cakes and liqueurs, and in aromatic drugs and for various other purposes.